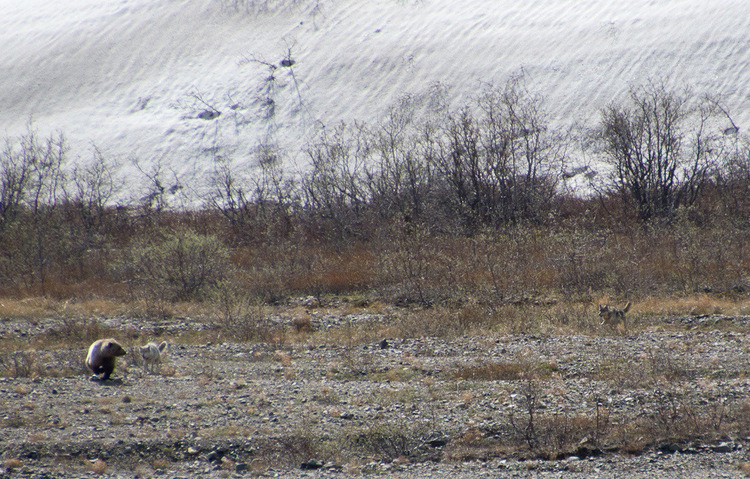 I knew the Green Shuttle buses in Denali, Alaska were great for viewing wildlife. 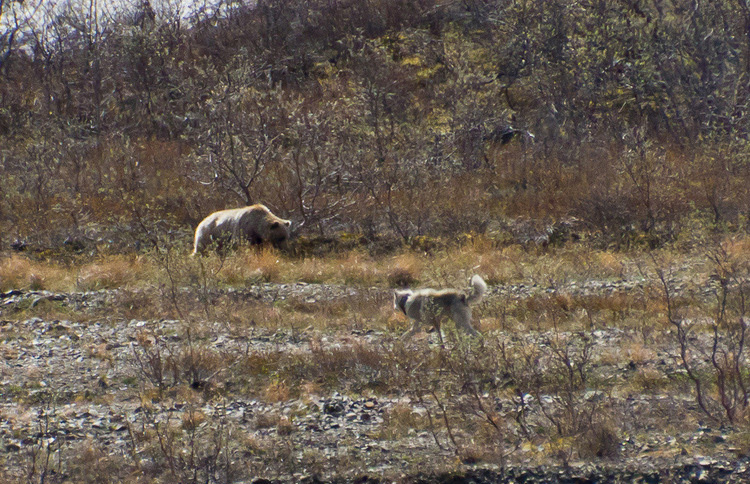 But I never expected to see two wolves stalking an unsuspecting grizzly bear. Sure enough, a cloudy colored wolf slinks along in the distance. I feel like I’ve won the lottery. I want to get my camera out but I can’t drag my eyes away from the scene before me, so I yell at my companion to get his camera out. Anticipation heightens as the magnificent grizzly unknowingly moves in the direction of the wolf. A few minutes later, the cries of ‘there’s another wolf’ are heard again throughout the Green Shuttle. I frantically move my binoculars around searching like a crazy person. 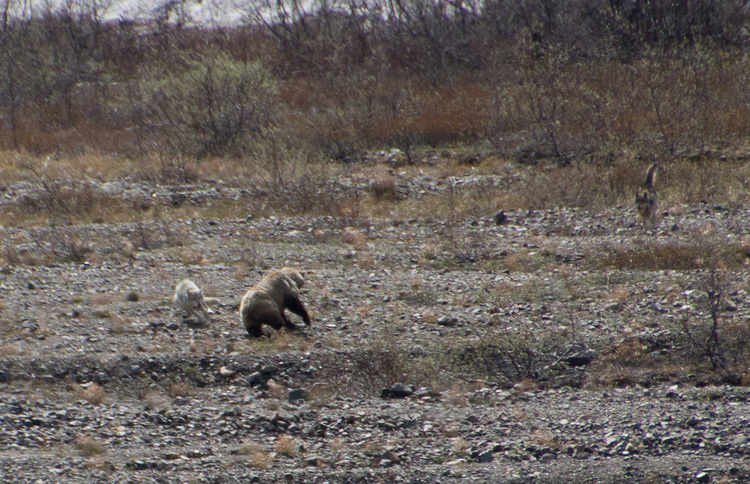 The second wolf (light brown and black) is travelling low through the grass to the other side of the bear. The wolves are obviously working together, and the tension at this point is electric. The grizzly bear puts its nose up, sensing something in the air. Within seconds the bear spots the wolves and it is obvious he has been completely taken by surprise. Taking advantage of the bear’s surprise, the closest wolf suddenly charges forward toward the bear. 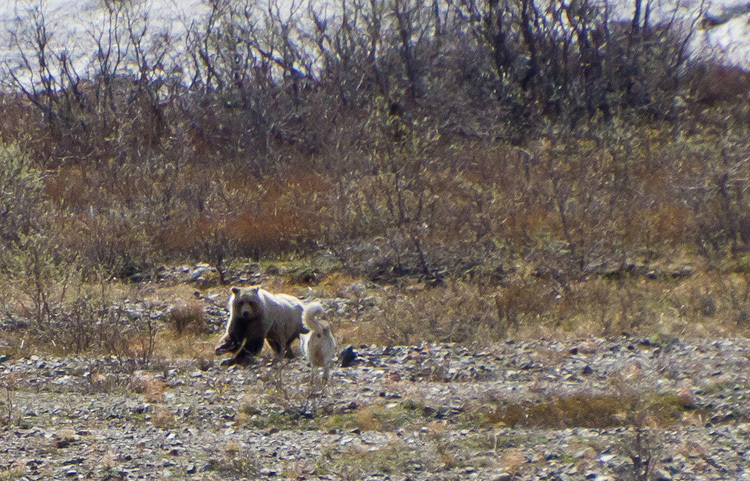 Running for its life, the grizzly glances behind it just as the wolf lunges. The bear swerves, and the wolf misses by a margin. The grey wolf backs off, but only for a moment, then both wolves crouch down and slink forward again. Light on its feet, the wolf manages to dance out of the grizzly’s clutches and the bear comes to a sliding halt. All animals stand there staring at each other, almost as if they are weighing up the pros and cons of every options – to attack again, or walk away. Focused and determined, the grizzly stares down the wolves. There are some actions and expressions that transcend language barriers, and this is one of those times. The message the bear sends is clear, – ‘Back off, because I am not going down without a bloody battle to the death’. Both wolves hesitate and all beasts eye each other a little longer. Gradually, the grey wolf changes its positions to a more defensive stance – the message has been received. All three animals partly circle each other in a calm but wary manner. Finally, they call it a truce and all slowly move in opposite directions.